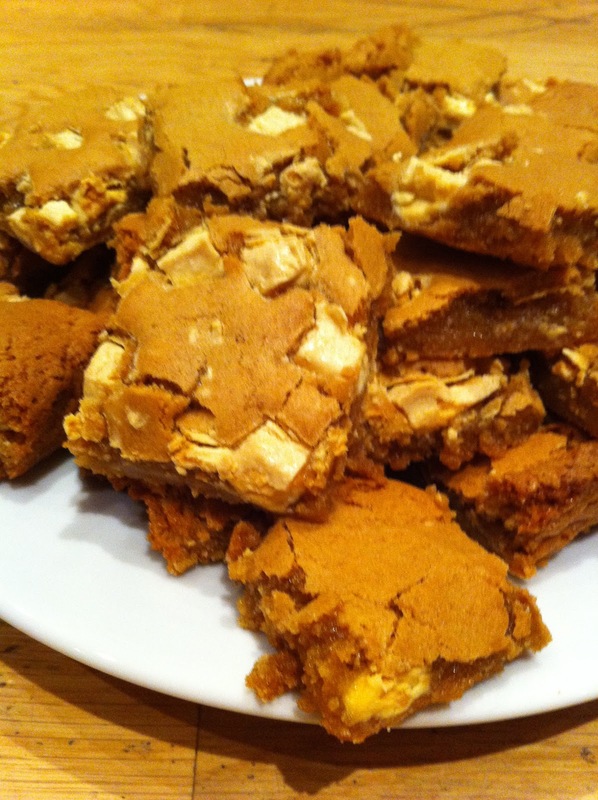 Aga Girls: Butterscotch and White Chocolate Blondies. This year instead of baking as a form of productive procrastination I am only letting myself bake when I have finished my work. I finished my dissertation proposal this afternoon so thought I would spend the evening baking a new recipe. I have read on a number of blogs about people making blondies which seem to be a white chocolate brownies. So I thought I would give them a go this recipe came of the blog jolts &jollies. This turned out to be a great recipe and one I will definitely make them again, my flatmate has already eaten six. Preheat oven to 180C or in a two door aga the grid shelf in the bottom of the roasting oven with a cold self. Line a 9x13 inch pan roughly the small aga roasting pan. Combine flour, brown sugar, baking powder and salt in large mixing bowl. To brown the butter heat it in a small pan stirring constantly until it goes a light brown colour. Then pull it off the heat and leave it cool in the pan where it will continue to get darker until it looks a bit darker than golden syrup. whisk together the eggs and browned butter. Stir the wet ingredients into the dry ones. Fold in the chocolate chips and spread in the pan. Bake for 30minutes until a knife comes out clean. They should still be gooey in the middle.